Virgil was born at home in 1935 in Andrew County, Missouri, one of seven children. In 1936 his family moved to a farm west of Meridian, Idaho and he attended grad school and high school at Meridian. In 1949, using a 12 gauge Winchester his dad won in a raffle, he went to a field and shot clay targets. That was the start of his shooting career. That fall he began going to turkey shoots in Melba, Homedale, Marsing, Wilder and the old rod and gun club south of Nampa. Virgil did this for the next 20 years. 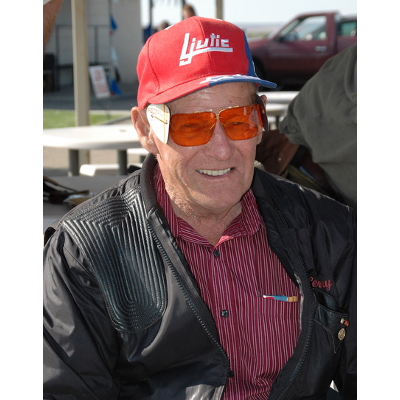 When he met AE “Sonny” Boyd, an Idaho State Champion at the turkey shoots (he referred to Virgil as the “Kid” and asked when he was going to start shooting registered targets which Virgil had no idea what he was talking about. His first registered shoot was in February 1968 at the old Boise Gun Club At that shoot he received his first punch. Hal Smurthwaite of White Bird broke 100 in singles, He wondered, “What was I doing in this game, this guy never missed a target.” Two months later at Ponderosa Gun Club VirgilI won the PITA Singles Championship and again in 1970. Virgil married and raised five daughters. His daughter Barb became an accomplished trap shooter. Virgil was a truck driver, auto mechanic and he joined the Pipe Fitters Union and became a welder for rest of his working career. In the early 70’s at the Spring Creek gun Club at Elko, Nevada he had the privilege of shooting on the same squad as Dan Orlich. In 1992 his daughter Barb shot ahead of him and broke 96 in handicap, he had to break the last 50 targets to beat her. They were featured on the cover of On Target magazine. In 2004 he represented Idaho in the Veterans class at the Grand American Champion of Champions at Vandalia, Ohio. Over the next 48 years Virgil won numerous award in excess of 100-200 and donated to many clubs. Virgil’s target count (combined ATA and PITA targets) is 210,625 as of 2016 and is a Life member of both associations. On his 77th birthday he broke 100 straight a singles event. He even celebrated his 80th birthday in Winnemucca, Nevada in 2015 and shot a 98 in the singles. Virgil plans to continue shooting until he can not stand. He loves this sport and has fun doing it.” Virgil was also a member of the PITA All Star Team in 1988, 1994, 2010, 2012, 2013 and 2014. A complete listing of his wins would most likely take too long to list. He has become a legend and a true one of kind in the trapshooting community as all that know him will attest.